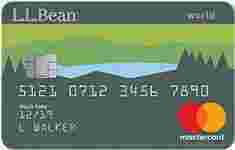 L.L.Bean Mastercard is typically available to those with good credit scores (650 or greater). - Free return shipping on items purchased at L.L.Bean. - Enjoy special sales and offers throughout the year. - Free monogramming on L.L.Bean products. - Get a 15% discount on your first L.L.Bean purchase upon approval with the new card.